Q: Why do some competitors offer carbon fabrics for bowing wall repair that are 20-inches to 24-inches wide, while Stronghold’s carbon fabric is only 10-12 inches wide? StrongHold’s fabric is only 10-12″ wide, resulting in less surface prep and less required material. A: The width of the reinforcing system required to resist external soil loads is contingent on the amount of tensile strength (measured in pound per inch per width) yielded by the carbon fiber reinforced system (fabric plus resin). HJ3’s patented reinforcing fabrics used for bowing wall repairs offer up to 2x to 2.5x the tensile strengths available in competitors’ products. Thus, competitors properly offer wider systems, up to 24-inches, to yield the tensile strength necessary to resist external soil pressures. The advantage of the 10-inch wide fabric is improved aesthetics (as less wall space is covered with the reinforcing system) without having to pay more money for the Stronghold system. Wider systems also require significantly more surface preparation, well over double the effort when compared to the Stronghold alternative. 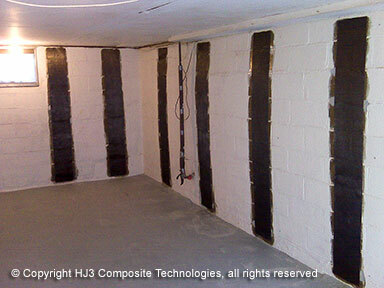 Q: Up to what deflection is carbon fiber an acceptable strengthening system for bowing walls? A: 2-inches is a good rule of thumb for most applications. To determine deflection in your wall, it is important to measure the difference at the greatest deflection (usually at the mid-span of the wall) as compared to the original plane of the wall. Q: What repair options do I have if my wall is deflected beyond 2-inches? A: Several options are available and offered by many Stronghold certified installers. The first option is to excavate out the soil that is pressing against your wall. Once the soil pressure is released the wall will gain back some or all of its deflection, bringing it below the 2-inch deflection limit. The Stronghold bowing wall fabrics can then be installed at their proper spacing. At this point, the installer will back-fill the excavated soil with sand and aggregate in place of your original soil to decrease the force that will build against your basement wall. A second option is to use steel mechanical systems such as steel tie-backs. The steel tie-backs tend to be considerably more expensive than the Stronghold Carbon Systems but are the only potential technique capable of removing the deflection from the wall without excavation. 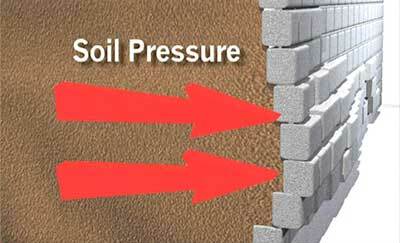 Soil pressure can push against your foundation walls, causing them to bow. Q: If my wall is deflected less than 1/2-inch, should I still purchase Stronghold to strengthen my basement wall? A: The deflection in your wall is a sign that the external soil pressures are greater than the load your wall can support. Over time, the deflection will most likely worsen. As your wall continues to deflect, crack patterns will form, allowing pathways for water to leak into your basement and for mold to form. By utilizing Stronghold carbon fiber systems at the first sign of deflection you can prevent the issues from becoming any worse. Strengthening achieved with Stronghold will brace the wall, allowing crack injection and waterproofing measures to stay in place to stop leaks and moisture penetrations. Q: My wall is deflecting inward at the top and doesn’t seem to have much of a “bow”, can I still use the Stronghold Bowing Wall Kit? A: No. If the top of your wall moving inward then there is most likely a different, more serious structural deficiency which no Fiber reinforcement system can stabilize. Stronghold systems work by developing the “internal” compressive strength within the wall, if the top (or bottom) of the wall is moving then the issue is considered to be an “external” failure. It is highly recommended this kind of failure be reviewed by a licensed civil or structural engineer. Q: Do I need to attach the Stronghold kit to the ceiling joists and the floor? A: No. Within a typical masonry or concrete wall there is a huge amount of strength which is undeveloped due to internal structural failures (as pictured above). By using the Stronghold Bowing Wall kit you are utilizing the strength already built into your wall instead of relying on your wood ceiling to resist the soil and water pressures. By tying composite reinforcement to wood, our competition is only transferring the force to another structural member, compensating for a reinforcement material which is weaker and has lower bond strength. Q: Why is Stronghold spaced between 2-foot on center to 5-foot on center while other bowing wall systems offered by your competitors are always spaced 4-foot on center? StrongHold straps are spaced between 2-feet on center and 5-feet on center, depending on the substrate itself. A: Some competitors, not all, space their reinforcing systems based on the American Concrete Institute’s (ACI) 530 design guideline which states that “the maximum spacing for external reinforcement is four times the thickness of the masonry wall, or generally 4-feet”. ACI 530, however, is specific to initial masonry design and makes no mention of plastic external reinforcement (carbon fiber systems are considered a plastic). As engineers we are responsible for using the state of the art design guide available to guide our repairs. 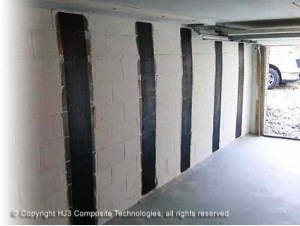 All designs for your basement therefore should be based on the latest “state of the art” design guide published by the American Concrete Institute, ACI440.3R (2008) “Strengthening of Concrete with externally bonded FRP composites”. ACI440.3R, unlike ACI 530, differentiates between the performances of steel reinforcement compared to the performance of plastics by considering reduction factors for sustained loading (the continued force of the soil pressure on your basement wall) on the carbon system. When companies’ properly follow ACI440, the varying parameters for basements (height of wall, height of backfill, thickness of wall, type of soil) will translate to specific loads (pounds per inch per width) and the specific spacing of carbon reinforcement required to resist those loads. I think we can all agree that steel behaves differently than plastic and that each basement application is different. StrongHold’s bowed wall repair kits follow the full 8′ height of a wall, gaining maximum strength over systems that only follow 5′. Q: Why do some competitors offering carbon fabrics only repair 5 feet along the height of wall, while Stronghold extends their bowing wall system along the entire height of the wall – usually 7 to 8 feet? A: Stronghold engineers recognize that no soil behaves the same way when exposed to different conditions. Distribution of external soil forces will not always concentrate in the mid-span of your basement wall. In some applications the concentration of forces may be in the upper 1/3 or bottom 1/3 of your wall. By extending the repair along the entire height, Stronghold engineers account for all three scenarios which ensures the most reliable strengthening system. If you cover only a portion of the wall – especially masonry walls – the path of least resistance for soil or hydrostatic pressure will be the areas not reinforced by the competition. Q: Can I trust that Stronghold carbon fiber systems offer the same reliability as steel systems? A: Yes! Over 20 years of Large-Scale Testing for applications that include repair and strengthening of concrete, masonry, steel, and wood structures support Stronghold carbon fiber systems. In each of these tests, carbon fiber was shown to out-perform steel alternative repairs. The Stronghold products never corrode like steel and offer greater tensile strengths without the obstructions or adversely effecting the aesthetics of your basement wall. The Stronghold products have also been installed in major commercial, industrial, and civil applications since the mid 1990’s with no failures. 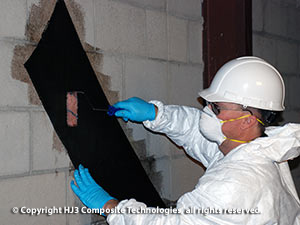 In fact, Stronghold’s parent company, HJ3 Composite Technologies, has repaired over 2,000 structures worldwide and sold over 1,000,000 square feet of carbon fiber for those repairs. Our carbon fiber systems are approved by the Department of Defense for blast protection, Mine Safety Health Administration for underground blast reinforcement for mine seals, Metropolitan Water District Los Angeles, CA for lining underground high-pressure water pipe, and various cities and county water, wastewater, and numerous state departments of transportation. Q: After reviewing Stronghold’s competitors’ products I noticed that they do not use a primer coat prior to installing their carbon fiber reinforcement. Is it important to use a Primer Coat prior to installation of the Stronghold Bowing Wall system? A: The answer is absolutely. The primer coat is an extremely low-viscosity epoxy that penetrates deep into the pours of your concrete or masonry wall. 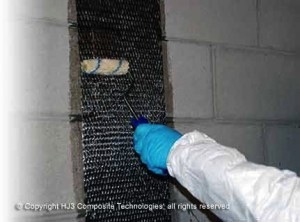 This creates a mechanical connection in your wall that greatly improves adhesion between the layer(s) of carbon fiber. By using the Stronghold primer, bond strength to the substrate is increased, allowing for proper load transfer of the external soil pressure through the wall to the carbon fiber straps. 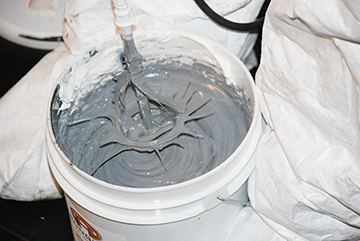 None of Stronghold’s competitors utilize a primer in their carbon fiber systems. Q: How does the price of the Stronghold repair kits stack up against competitors’ products? A: Even though the Stronghold products offer superior testing, engineering, and strength when compared to the competition it is priced very competitively with those repair systems. Yet, what often isn’t considered when comparing the price of the Stronghold kits is that our kits include a primer coat (critical to adhesion) and all of the consumables and installation equipment necessary to install the Stronghold system. The competitors’ pricing only includes the carbon fiber and the associated resins. Q: Can the Stronghold Bowing Wall Repairs be used to fix settlement or sagging walls? A: No matter what anyone tells you, the answer, at this time, is NO! If any contractor tells you that the carbon fiber can resist settlement make sure to contact Stronghold and discuss their recommendation with one of our on-staff structural engineers. Settlement in a home is a serious structural issue that must be evaluated by a structural engineer (PE/SE) licensed in your state. While there has been research completed on the use of carbon fiber for resisting settlement forces, it is still not an accepted repair procedure. As Stronghold completes testing and research on these issues we will publish the results here on our website. Q: Is there anything I can do to prevent further damage with or without a Stronghold Repair? Installing gutters to allow the drainage system to guide runoff away from home. Bring in extra fill material to create a “positive grade” away from home (often times dirt slopes toward wall, causing water to pool up and soak in). Avoid having plants or trees near the wall, water from irrigation systems routinely cause problems especially if there are unknown leaks. Roots also can press against the wall or grow into tiny surface cracks, making them expand. While not water related, homeowners should limit surface loads (installing a new driveway, building, patio, or other structures) next to the wall to avoid extra lateral pressures. Q: Why should I pay the expense of adding the Stronghold crack repair system to the cost of crack injection or patching cracks in my basement wall? StrongHold’s carbon fiber provides the tensile strength your wall needs to ensure that future cracking won’t occur after your cracks are injected. Q: Can I apply the StrongHold crack repair system over cracks if they appear to be leaking? A: You’ll need to stop the leaking prior to installing the StrongHold crack repair kit. If the wall is actively leaking, the water will prevent an adequate bond between the carbon fiber and the wall, and your installation will likely fail. A small amount (10% at the most) of moisture is permitted when installing the system. To determine if your wall is dry enough, hold a tissue against the wall and let go. If the tissue sticks to the wall, it’s too wet to apply carbon fiber and will need to be dried first. For best results, fill the crack with a urethane crack injection that will stop the leak. If the tissue falls to the floor, your wall is dry enough to install the StrongHold crack repair kit. Q: Why is the Stronghold crack repair system comprised of a multi-axial fabric for crack repair? A: Crack patterns on your wall may not be exactly horizontal or vertical. Often times the crack patterns are all of the above – horizontal, vertical, and diagonal. For simplicity it is therefore beneficial to orient fibers in a multi-axial formation in order to provide multi-directional strengthening along the surface of the cracked wall. 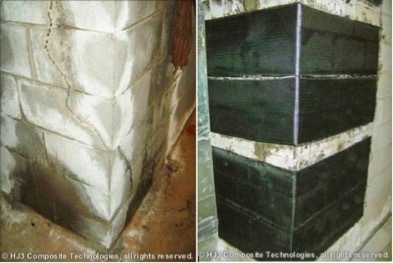 Testing performed by HJ3 Composite Technologies LLC, Stronghold’s parent company, demonstrates the benefit of multi-axial fabrics to create shear confinement and strengthening along the surface of masonry structures to resist in-plane shear loads. (Click here to review this testing). StrongHold’s carbon fiber is a great solution for cracked corners. Q: Can I use the Stronghold crack repair system for corner repairs and other applications? A: The Stronghold multi-axis fabric system included in the crack repair kits can be used to strengthen external corners in your foundation walls. 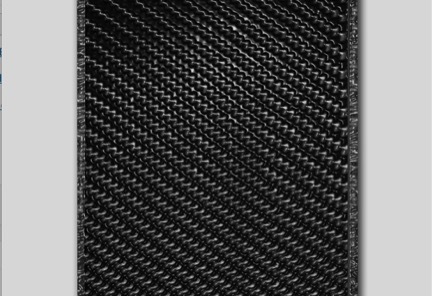 The carbon fiber will serve two purposes: (1) confine the corner to resist displacement; (2) seal the corner from allowing water to penetrate through cracks that have formed in those corner areas. Q: Why is the Stronghold crack repair system superior to alternatives offered by competitors? A: The Stronghold crack repair system confines every inch of your crack with carbon fiber and extends 6-inches on both sides of the crack to resist crack propagation. Competitors products are “stapled” every foot or so along the length of the crack. These “staples” offer less than 2,000 pounds per strap and are spaced 12-inch along the length of the crack. Thus, per foot of crack you receive 2,000 pounds of tensile strength. Meanwhile, the Stronghold crack repair system offers over 10x that strength over that same foot of crack, or about 25,000 pounds per foot reinforcement. Competition’s system also must be inserted into your wall, while the Stronghold system can be surface bonded. The Stronghold crack repair system is also not sold at a premium even though you receive considerably greater benefit. Q: Can I use the Stronghold Crack Repair System in place of crack injection repairs? A: Many times the Stronghold Crack Repair System is used in conjunction with crack injection systems to extend the life of the injection repair. However, if the cracks are primarily surface cracks and do not extend through the wall, the Stronghold Crack Repair System can be used in place of the crack injection repair. Stronghold offers a thickened epoxy paste that can be used to fill cracks in the substrate prior to installation of the Stronghold Crack Repair System.